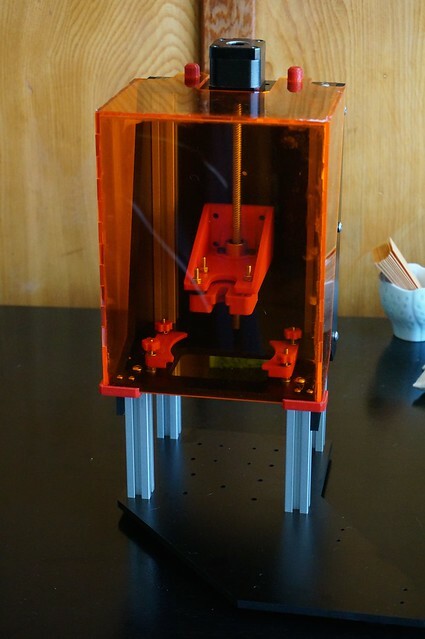 I’ve spent a good part of this weekend working on finishing my build of a LittleRP resin 3D printer. There was a kickstarter for kits and assembled printers from its creator but he’s also been on IRC in #dlp3dprinting on Freenode for quite a while. The design is CC-licensed right now, not true open source, but he’s been sharing his bill of materials and plans for the lasercut and 3d printed parts with anyone who wants to build one. I assembled parts mostly in August but then had to go to three security conferences and a week long trip away for work in the course of six weeks so I got derailed from assembly. In the meantime, he’s started documenting things a bit for assembly so the wait was probably a good thing. This is probably about $400 or $500 in parts plus an HD projector that costs $300-400 (I got it for the low end because a refurbished one was fine). 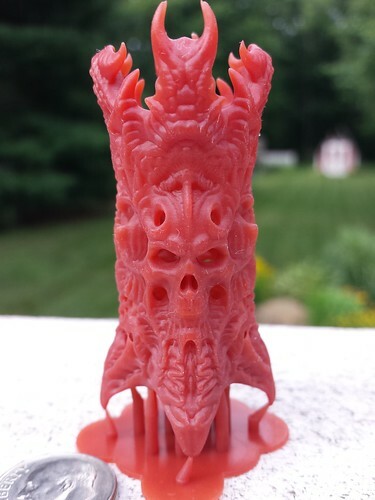 You can see a gallery of sample prints from the creator, which are of a much finer level of detail (and much smaller) than what you get from FDM printers like your printrbots or mendels. Another guy who has finished building his using the same process as me is Shane Graber and he’s got a pretty good gallery of his machine and sample prints on Flickr. My plan, other than just having an interest in playing with this technology, is to use the printer for tabletop RPG and other gaming pieces or parts. The level of detail is so high for the small sizes of the prints that games are a great application of this, assuming one is into game playing and design.